In my day-to-day life as a computer geek, I find myself surrounded by information. For better or worse, it is my job to try an take this data and make intelligent decisions based on it. To be quite honest, I have been fumbling with how to organize and use the data. Between high-school statistics class and various blogs I have been somewhat successful, but there is something to be said for a structured educational process. Today I came across a course by Udacity (http://www.udacity.com) that may be just what I am looking for. 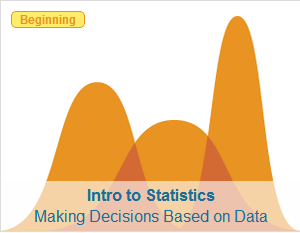 The course - Intro to Statistics - uses information to visualize data and make intelligent decisions based on it. The class starts on the 25th, so I shouldn't have to wait long to begin using it. Thanks for some other informative web site. Where else may just I am getting that kind of information written in such an ideal way? I have a venture that I’m just now working on, and I have been at the look out for such information. Hadoop Online Training .